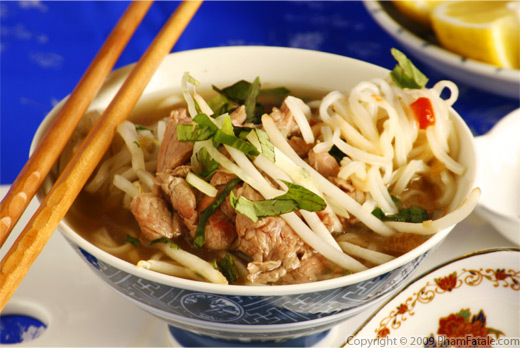 In Vietnamese cuisine, it is very common to eat soup for breakfast. Súp bún măng gà, literally bamboo and chicken rice noodle soup, is a wonderful way to start your day. 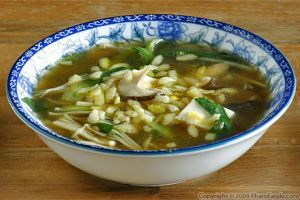 The key to making excellent soup is to make excellent broth, and that is largely dependent on using young bamboo shoots and infusing it with the aroma of chicken. This recipe is also perfect for a rainy day or when you're a little under the weather. You can make a big pot of the broth and freeze it for later use. Just reheat, add some cooked chicken and bamboo shoots, and you're ready to eat. Try this recipe the next time you need some chicken noodle soup for your soul. Fill a medium-sized pan with about 2 quarts of water. Bring to a boil. Add the rice vermicelli noodles. Wait for the water to come back to a boil (about 1-2 minutes) then lower the heat to medium-low for about 8 minutes. Drain the liquid. Rinse the noodles. Set the noodles aside. Heat about 1 inch of canola oil in a skillet. Fry 3 onions and shallots in the oil, stirring frequently to prevent the onions from burning until the color is evenly golden brown. Drain on paper towels. Set aside. Bring about 7 quarts of water to a boil. Add the sliced ginger, fried onions and shallots. Add the 2 whole chickens and chicken carcasses to the onion broth. Cook for about 10-12 minutes. Remove the whole chickens from the pot. Let them cool a bit until you can handle them without discomfort. Make several deep diagonal incisions throughout the birds' flesh. Place the chickens back in the broth. Add the daikon, whole onion, rock sugar and mushroom seasoning salt. Bring to one more boil and simmer for another 30 minutes until the whole onion and daikon are soft and tender. Sprinkle freshly ground black pepper to taste. Season with salt. Bring back to a boil, then immediately lower the heat to a gentle boil. Cook for another 10-12 minutes. Remove the chickens and shred the meat. Set the meat aside on a platter. In a different deep saucepan, bring about 1 quart of the chicken broth to a boil. Add the sliced bamboo shoots and cook until tender (about 10-15 minutes). Be organized. Line up 8 large bowls. Place some vermicelli noodles, chopped white onion, shredded cabbage, green onions, bean sprouts, cilantro and the other Vietnamese herbs in each bowl. 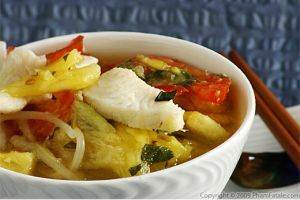 Add the boiled, drained rice noodles, following with the boiling broth with sliced bamboo shoots. Top with shredded chicken. 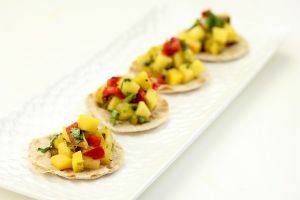 Serve with chili garlic sauce, Thai basil, mint, jalapeno peppers and the bird chiles. Drizzle some nước mắm to the broth to finish. If you want to make a very authentic soup, the choice of chicken is crucial. Buy it from your Asian market and ask for a gà đi bộ, literally a walking chicken. In Vietnam, the gà đi bộ chicken are considered "free-range"; the chickens are "trained" to run and as a result the meat has a totally different texture as the chicken found in American grocery stores. You can find ready-packed chicken carcasses at Asian stores, but I usually use the chicken thighs and chicken breasts to make other dishes such as chicken cacciatore, gơi gà (Vietnamese chicken salad) and keep the bones and carcasses for making chicken broth. Did you know? The flatter the onion is, the sweeter it is. I always try to pick flatter-shaped yellow onions at the market. Mushroom seasoning salt brings a very distinct, earthy flavor to the sauce. 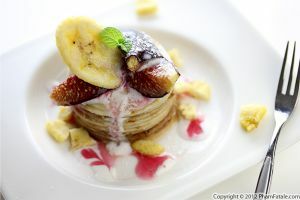 You can find it at gourmet specialy stores or in most Korean stores. I get mine at Marina Foods -10122 Bandley Drive -Cupertino, CA 95014. They also have a great food-court. I love their Chinese duck. Daikon (củ cải trắng in Vietnamese) is an Asian turnip that looks like a large white carrot. I use this root a lot for making broth for the natural sweetness it brings. Discard the root when the broth is ready. It's also delicious when it's pickled with carrots and is commonly used in Vietnamese bánh mì sandwiches. I love bean sprouts; they add some crunchiness to the dish. Vietnamese mint has a very different flavor from regular mint. It also has darker vein marking on the leaves. It's commonly used in Asian salad the Vietnamese chicken salad and also in springrolls (gỏi cuốn in Vietnamese). Check out my recipe for chili garlic sauce, tướng ớt in Vietnamese. It's ultra easy; all you need are super fiery, spicy deep red chiles. Rau răm and ngò gai are Vietnamese coriander leaves used in South Asian cooking. I buy them at the Asian market. If you don't have any, just double the amount of regular cilantro. Don't discard the onion-flavored oil; save it for your next salad dressing. If you have chicken broth left over; place the broth in containers and store in the freezer. You can keep them up to 6 months. You can make the exact same soup with duck meat. It's then called bún măng vịt and it's just as delicious. 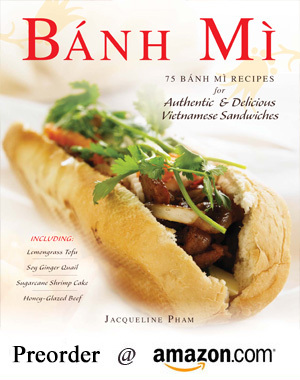 Published By: Jacqueline Pham on September 9, 2009. I could eat this fabulous soup all day and night! Beautiful! 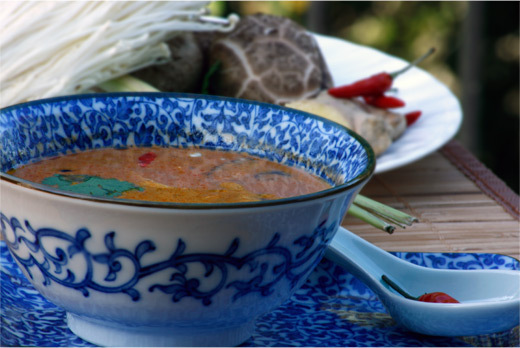 bun mang vit, a favorite of ours, without the dried bamboo. great tips on broth. This looks both lovely and delicious, as usual. I can see soup being very soothing. Somewhat like having porridge. I've never been much for sweet things at breakfast in any case.